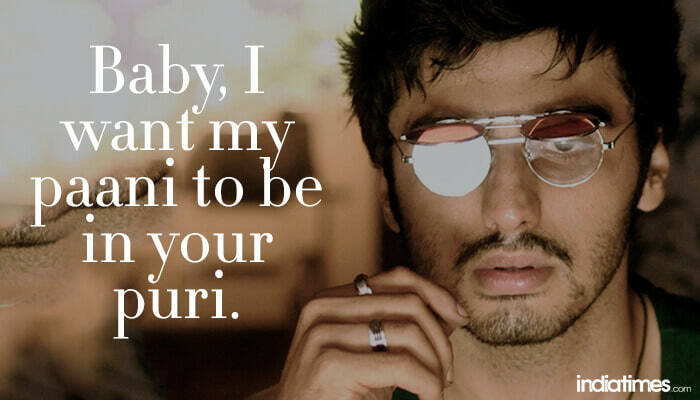 Some Bollywood dialogues are at their quirkiest best. Even the really cheesy pick-up lines seem like fun. So, won't it be a whole lot of quirk, cheese and endless laughter trail if we use them in our lives? "Mard mein bahut dard pehda kar deti hai tumhari smile". (Love Aaj Kal) – When bae gives you the cutest smile evuurrr!! "Internet connection ki speed se pyar hota hai…aur utni aasani se logout bhi ho jaata hai" (Mujhse Fraaandship Karoge) – When you’re so obsessed with the INTERNET, you just can’t help but talk I the internet language! "Mere dil, jigar, liver mein ho tum … waqt bewaqt aaye woh fever ho tum…ab toh meri life mein forever ho tum". (Mujhse Fraaandship Karoge) – Failed attempts at being cheesy plus trying to rhyme for you crush…but still an attempt okay? It counts! "Isse badi saza kya hogi…ki jaan bhi nikaal li aur zinda bhi chhod diya". (Goliyon Ki Raasleela Ram - Leela) – When your crush rejects you but you’re still keeping it cool! "Tum pehle bhi itni khoobsurat thi…ya waqt ne kiya koi haseen sitam?" (Yeh Jawaani Hai Deewani) – When bae’s all dressed up and you just can’t take your eyes off! "Mein paise ke liye kuch bhi kar sakta hu toh soch mein apne pyar ke liye kya kya karunga". (.. Rajkumar) – Giving your crush an assurance when she asks you to prove your love for her. "Apni saans wapas lene aaya hoon … atakke reh gayi hai tere paas". (Goliyon Ki Raasleela Ram - Leela) – When you know you’re a pro at being cheesy! "Is honey ke liye toh main moon tak jaane ke liye tayyar hoon" (Ready) – Giving a future reference in a smart way! "Tum oxygen aur main double hydrogen … hamari chemistry ekdum pani ki tarah hai." (Hasee Toh Phasee) – When both of you are in love but just can’t get over your nerdy cheesiness! "Gusse se bolegi... Nahin jaunga… Pyaar se bolegi Marr bhi jaunga". (.. Rajkumar) – When bae’s all mad at you but you know how to hit the right chords. "Tumhari smile kitni dangerous hai pata hai? … mere paas dil hota na, toh pakka aa jaata ispe". (Yeh Jawaani Hai Deewani) – When your crush has the smile that wins hearts! Did she say yes? Take her out on a date soon!